I'm excited to share a fun winter themed literary activity with you today! 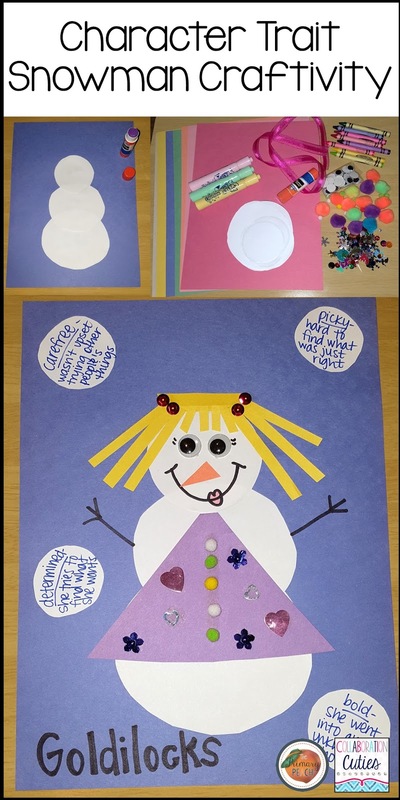 Have students create snowman characters to show what they've learned about character traits and text evidence. Students choose a favorite book character or a character from a book you've read together. It could even be a historical figure from social studies! Have students create a snowman of the character adding details specific to the character they have chosen. Students want to make the snowmen look like the character. In this example, Goldilocks has blonde hair and a purple dress with sequins. Give each student white circles or let them cut their own and a piece of blue construction paper. You can provide students with crayons, markers, construction paper, stickers, yarn, sequins, felt, etc. to create their snowmen. Then, students create character trait snowballs. They write a character trait on each snowball and text evidence to support the traits they've chosen. In this example, the student chose four character traits to describe Goldilocks. She wrote each character trait on a snowball and cited evidence from the text. Depending on the the grade level, you could do this step with students as a whole group or students could work independently. You could also brainstorm a list of character traits together that students can refer to while they work. For students in the lower grades, you can give students a printed list of character traits and they could cut them out and paste them on the snowballs rather than writing their own. This is an easy, engaging hands-on way to assess student learning! These make a great display for bulletin boards and hallways too! I hope you and your students enjoy designing your snowman characters! I like to read your blog. Thanks for the info.